The man was charged with reckless driving, hit-and-run and driving under the influence. A Clackamas County police dog is credited with tracking down a driver after he fled from a crash in Oregon on Tuesday evening. The driver, 36-year-old Erik B. Sharp, smashed into a utility pole and left a 36-year woman trapped in the car. The dog found him after a two-hour search. Fire crews rescued the woman from the car. The man and woman were both treated at Mount Hood Medical Center. Sharp was charged with reckless driving, hit-and-run and driving under the influence. 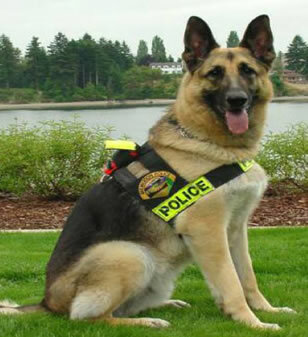 What was the name of the Police Dog?